The MCPO market has grown rapidly at a CAGR of ~20% from 2016 to 2017, to cross US$1.7 billion. It is currently dominated by only a handful of service providers; however, due to rapid growth in evidence, other providers are also beginning to adopt new strategies to gain market share. While technology and partnerships continue to play an important role, providers are coming up with innovative solutions to maximize their process and geographic coverage. Value-added services, such as mobility, analytics, and service delivery automation, are gaining greater importance. This report examines the dynamics of the Multi-Country Payroll Outsourcing (MCPO) service provider landscape. It provides a deep-dive analysis of how the service providers shape up in terms of their market impact and vision & capability. 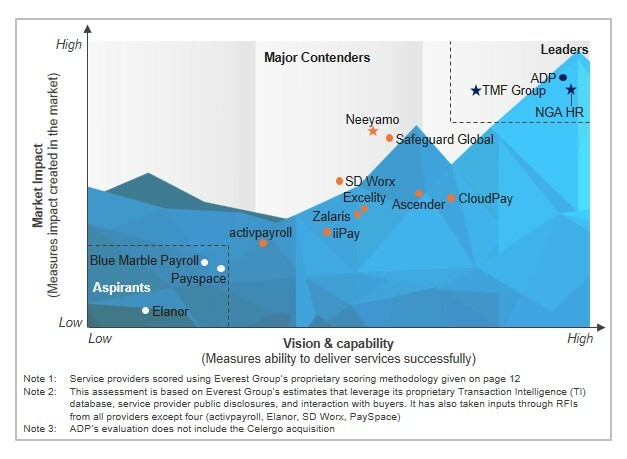 Based on the comprehensive Everest Group PEAK Matrix, 15 MCPO service providers are segmented into Leaders, Major Contenders, and Aspirants.